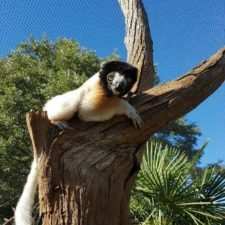 I hope you enjoy this series of blog posts about my trip to Madagascar in August/September 2016, and it inspires you to travel to Madagascar and experience it yourself! Traveling south on the RN7, I stopped in Antsirabe, Ranomafana, Kianjavato, and Ambalavao. Visiting several Lemur Conservation Network members as well as community reserves, national parks, and artisan workshops, I gained insight from our members on the ground as well as local guides and villagers. View my last post about Antsirabe and Lake Tritriva. The small town of Kianjavato is located about 1 1/2 hours east of Ranomafana National Park on the RN 25. 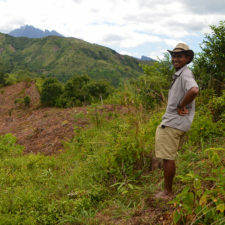 This is where LCN member Madagascar Biodiversity Partnership has one of their four main field sites, and where their partner Conservation Fusion plays the important role of teaching and inspiring local children to conserve their unique land. I visited this field site for one day and night to see their work first-hand, visit the lemurs in the nearby forests, and meet with two of the nearby schools. In future posts, I’ll share what I learned here and fill you in on the truly amazing work these two organizations are doing. But for now, I must tell you about our night hike in search of aye-ayes, because it is one of the craziest experience I’ve ever had. After a fulfilling day seeing many diurnal lemurs in the nearby forest, visiting MBP’s nurseries, and meeting with schools, it was time to go find some aye-ayes. It was about 5 p.m., and one of MBP’s aye-aye trackers says, “If we want to see the aye-ayes, we need to leave now.” Okay, into the car we go. Grab some water, a headlamp. 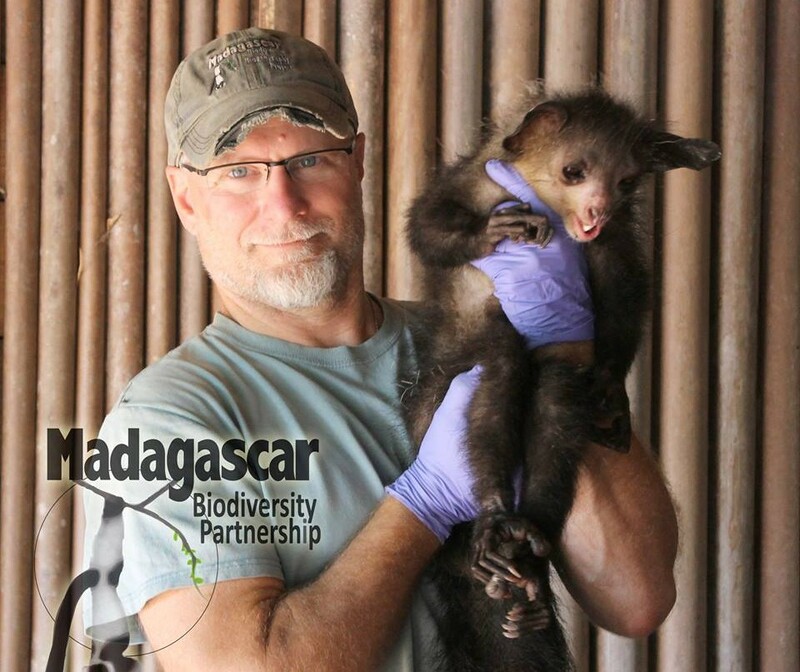 Dr. Ed Louis from Madagascar Biodiversity Partnership, victoriously posing with this aye-aye after his team spent over a year tracking it to outfit it with a GPS tracking collar to make it easier to track and research them. After a surprisingly easy walk to see black and white ruffed lemurs in the daytime, I’m thinking this should be a breeze. Yes, my guide Théo in Ranomafana warned me that hiking in Kianjavato is tough and there aren’t a lot of trails, but it hasn’t been tough so far. My driver Zina tells me he’s going for the hike too. After 16 years as a driver and guide in Madagascar, he’s never seen an aye-aye in the wild and this is his chance. Plus, I had told him how easy it was to see lemurs here in the day time. The aye-aye trackers at the Madagascar Biodiversity Partnership spent over a year on the trail of these aye-ayes, following their markings and other clues to finally be able to collar them with GPS units just recently. This is serious dedication, and a little bit crazy considering these animals sleep high in the trees and are only active in the dark of night. Walking briskly ahead of us, the trackers use a large GPS antenna to try to locate the collared aye-aye. We climb up, over, and through the forest, off the trail, under and over too many vines and branches to count, trying to avoid getting permanently tangled in the forest. It’s still light out as we follow the GPS signal up, down and over this mountain. The aye-aye is close, but where? As the only non-Malagasy in the 6 of us, it’s clear to me that I’m sweating and panting much more profusely than the others. They’re not even drinking water; they must know a secret or just be so accustomed to these arduous treks that running sideways on mountains through thick forest cover is no biggie. 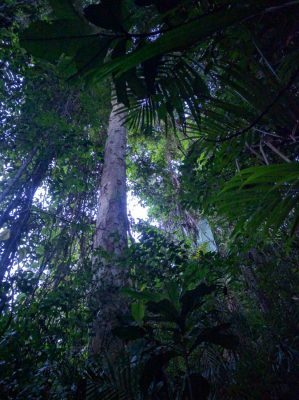 The forest where we search for aye-ayes. 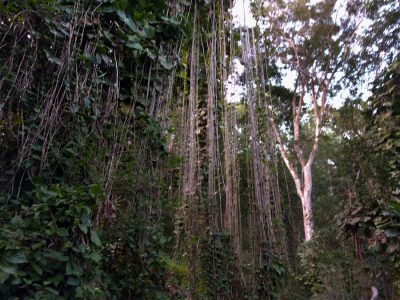 Lots of crazy vines if you’re looking for your Tarzan moment! I look back occasionally at Zina, who isn’t even wearing hiking shoes but doesn’t seem to be breaking a sweat. We laugh. What have we gotten ourselves into? It’s certainly too late to turn back now, and who would want to? This is adventure! It becomes apparent that following a GPS signal through a forested mountainside isn’t an exact science. Later, back in Antsirabe, a Dutch tourist remarks that following GPS to find lemurs is cheating, but after this experience, I can’t imagine finding them any other way. My admiration for the trackers who spent over a year to collar them grows with each uphill step. Finally we stop. In the middle of the forest, on a slope. It is determined that the aye-aye must have a nest in this tree. It is a very tall tree. It’s not even dark yet, and the aye-aye is definitely not moving until it is. As we wait, the rest of the group converses occasionally in Malagasy. Zina tells me one of the trackers tells him that sometimes they wait until 3 a.m. for the aye-aye to make a move. With the prospect of many more hours of waiting, I think Zina might be regretting his decision to join us, but as it gets dark, it’s clear we’re both in it for the long haul, hoping this aye-aye is feeling antsy to leave its nest. Lemur watching is hard on the neck, especially when you can’t see the lemur because it is hiding in a nest but you think it might move so you can’t look away, but you’re not exactly sure where the nest is. So we keep looking up, and we keep waiting. There is an aye aye nest somewhere in the vicinity of this tree. One of the aye-aye trackers has a huge light he is shining on the general vicinity of the supposed nest as it gets darker. Another randomly finds a brookesia micra (a tiny chameleon) just hanging out in front of him. And we wait, necks crooked up. After a bit, someone notices a movement and motions for me and Zina to come over to the tree. The one tracker has been perched about a meter up the tree standing on a rather thick vine. I’m supposed to go up there now too. I manage to lift myself up despite having spent three days testing my legs in hilly Ranomafana. As we wait longer perched on this precarious vine, I wonder how strong and stable it really is. We wait another 45 minutes in tree-hugging mode with no aye-aye movement. Thankfully, the vine holds us all. I see two eyes glowing for a second and wonder if that will be the extent of my sighting. My mind starts wandering and then suddenly another movement! There is a mom and her baby. Aye-ayes are typically solitary with ranges up to 5 km, but since this baby is fairly young, the two are still together so we get two aye-ayes for the price of one! The mom is making small movements and it is very difficult to discern much beyond a general shape and movement. Then, it is on the move! We all pivot to turn around; it has moved down the branch and onto another. We see the full body movement and silhouette of the mother. We did it! We saw a mother and baby aye-aye in the wild! Now we face the trip down the mountain…in the dark! It was as insane and ridiculous as you can imagine. Vines overhead, under foot, at waist height, and pretty much everywhere. And did I mention we were on a steep slope with no trail? And we could barely see? Me, Zina, and the MBP crew managed to get down the mountain without falling. 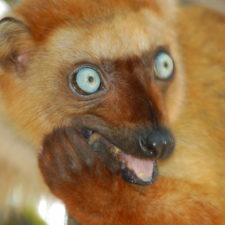 Now, I won’t pretend that I didn’t slip on the flat trailed part, but I blame the lemurs. They really like jackfruit and discard the slippery part on the ground, specifically to trip innocent passersby so they can have a laugh. Where I Stayed in Kianjavato: There are no hotels and no tourist infrastructure in Kianjavato. I stayed in a tent as a guest of the Madagascar Biodiversity Partnership. Until a tourist infrastructure is developed, a very limited number of tourist visits can be arranged through Za Tours. 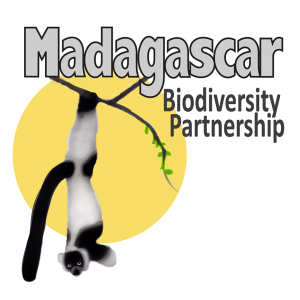 Donate to the Madagascar Biodiversity Partnership on their website and view their LCN profile. Donate to Conservation Fusion on their website and view their LCN profile. 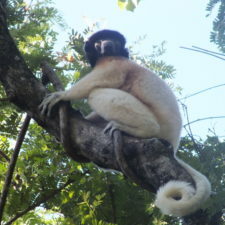 Volunteer for the Madagascar Biodiversity Partnership.